Late 80's/Early 90's (?) 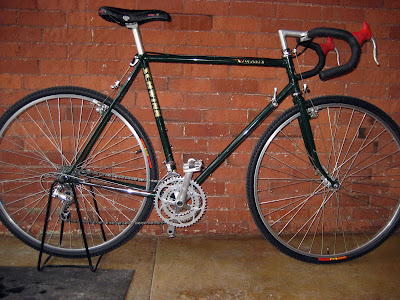 58cm Schwinn Voyageur Touring Bike w/56cm top tube. Made in Japan by Bridgestone, for Schwinn, this bike has 27" wheels with new Club Roost Cross Terra tires (27 x 1 3/8") and would make and excellent touring rig or all day gravel grinder. This thing is in IMMACULATE condition. Forest Green paint. I can't believe no one has bought this sweet gem: 1988 RB-2. 53cm c-c, 53cm top tube. Pretty sweet condition, right dowwwn to the bio-pace chainrings. If this doesn't sell by the end of next week, it's getting converted to fixed gear, and the price will go up to prove it. Right now: $350. Happy NÃ¼ Metal Year Everybody.